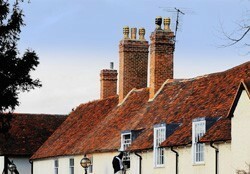 Our roofers are West End's local specialist roofing company. Whether your chimney needs re-pointing or you'd like a Velux window installed in your property extension, that's OK with us! Many customers come to us after receiving shoddy workmanship from other firms or having received several high quotations and are amazed at what we offer for such value for money. Our roofing team are passionate about providing the best service possible - only a top quality roof will do to keep your West End property safe, so we strive to be the best roofers, and have done for many years. That's why we have such a great reputation. We're confident in our ability to provide the best roofing services in West End, (all of G11, G12 and G13), so we always offer our customers an extensive guarantee with every job. For professional roofers that you can depend on, call us on 0141 340 9604. Get in touch with our experts today, and you'll be surprised how little excellent craftsmanship will cost. All our estimates are free! All our Glasgow customers get a free estimate - just ask! We've been serving the Glasgow area for over 25 years! It can be a real chore searching for quality tradesmen. But we're pleased to inform you that with our roofers you're in safe hands.